1. Encourage healthy eating right from their young age - Provide plenty of vegetables, fruits, and whole-grain products, include low-fat milk and dairy products, choose lean meats, poultry, fish, lentils, and beans for protein needs, encourage your kids to drink enough water, limit their intake of sugar-sweetened beverages, sugars and saturated fats. 2. Keep your kids active - Make them move around. This will strengthen their bones, increase self esteem and help them in weight management. Try involving them in any sport. 3. Introduce new foods - Be creative. When you are trying to introduce a healthy entrée that your child might not like, accompany it with a healthy food that your child may like - a fruit or some vegetable could do the trick! This way your child may accept the new food easily in the presence of something familiar. 4. Cut down the time spent on sedentary activities - In addition to encouraging physical activity, make sure your child spends not more than two hours per day on sedentary work like watching television, playing video games, or surfing the web. 5. Eat together as a family - This will help your children develop good eating habits, allow them explore more food varieties and will prevent them from indulging in unhealthy eating habits. 6. Shop wisely - Buy healthy foods that you want your child to eat. It will boost your family's health and you don't have to worry much about which food your child is choosing for a snack. Swap chips, chocolates, cookies you normally put in your cart with healthier options like dry fruits, nuts, wheat crackers, fruits, sprouts etc. 7. Keep your kid's stress level low - Some studies have shown that kids with stressed-out moms are more likely to be overweight. The cause of the stress can be anything from health problems in the family, money issues, or problems with a partner. . By handling stress in a healthy way, you can set a great example for your kids too. 8. Give importance to sleep - Studies have found that lack of sleep is associated with weight gain. When you don't get enough sleep, changes may occur in hormones and metabolism that may increase the risk of obesity. So try to remove distractions from your child's bedroom like TVs, cell phones, computers etc. 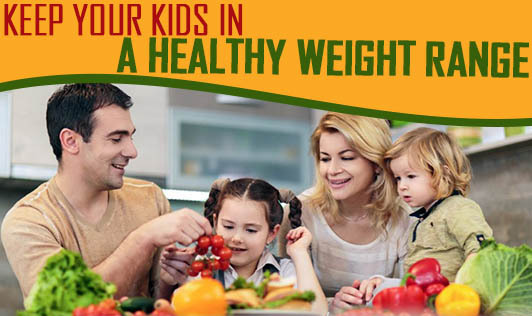 Here are a few simple ways by which you can ensure that your child has a healthy weight.